After creating the resin replacement parts for the 1:1000 scale movie Enterprise, I set my sights on the newly re-released Enterprise-D, Picard's ship. 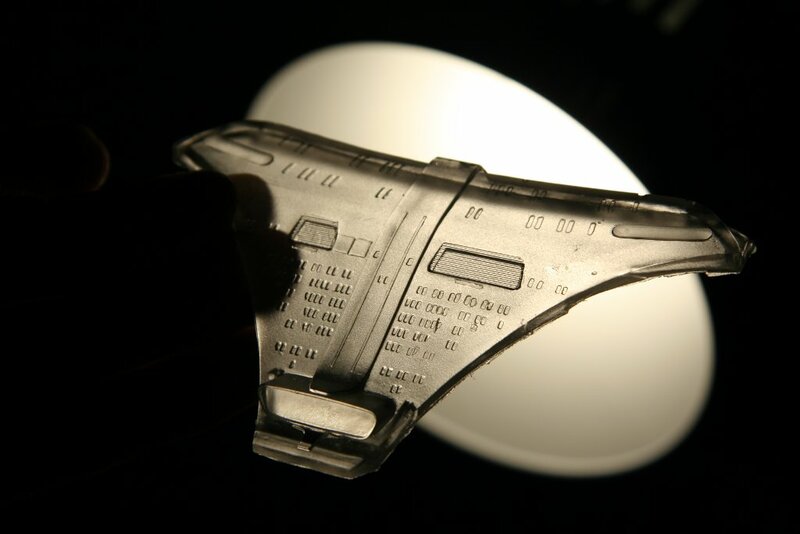 This new re-release is done in clear plastic, making it ideal for lighting. It is overall a great kit, but everytime I see it, the details of the dorsal surface of the neck connecting the two hulls stand out as being inaccurate. The goal was to correct this issue in a way that others could benefit from. Obviously, the idea was to make a replacement part in clear resin. There are many details that needed correcting, and it is a large part. It took much longer than expected; initially, the part was to be completed by the start of the year. Nonetheless, I'm finally pulling decent castings from the (rather large) mold. Just a few details left to tie up in terms of decals, instruction sheets, and the web site. But it sure feels good to get a project done. It would appear that May has come and gone. Amidst the lousy weather, it went by quickly. I managed to spend the first week of the month vacationing in Vancouver. There was also a long weekend trip to Toronto. The big achievement for the month was finally finishing the model boat that's been on the bench for a year-and-a-half. The kit started out as a poorly-built and abused Billing Boats "Thor" model. The kit currently lists for a rather high price and this model was just begging to be redone nicely. Getting this model up to spec was challenging. Removing the old paint and gobs of glue and uncured polyester resin was messy work. Many replacement pieces had to be scratchbuilt. Sections of the hull needed replacing. Likewise, many of the detail pieces needed to replaced. A rebuild of the jet propulsion system was required. Lastly, the model has full internal lighting and is built with more detail than the plans indicate. All in all, a solid chunk of work. 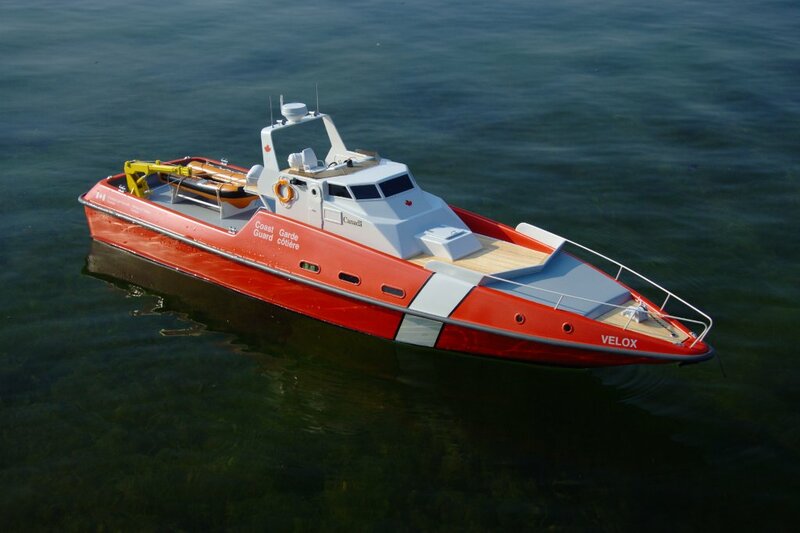 Rather than use the somewhat dull suggested paint scheme, I have renamed this ship Velox and given it Canadian Coast Guard colours. The red paint is actually paint from a CCG shipyard, heavily thinned and airbrushed. I think it works very well, and the service would be proud to have a vessel like this. The last few days of May finally brought decent weather and the boat was in the water for the first time. It performed beyond expectations. Now, on to June!